"Being able to operate everything on the one system has helped us provide a better retail experience from just knowing what is available, to ringing up items quickly. It has really helped us modernize our store." Bounty Hunter Rare Wines and Spirits has been in business since 1994, offering the best of Wine Country with a fun and authentic approach. In addition to local Napa Valley wines, Bounty Hunter sells wines from all over the world and offers an outstanding selection of spirits. They also operate a bar and restaurant specializing in barbecue and pairing each dish with the perfect selection of wines and spirits. 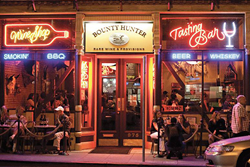 Bounty Hunter uses SuitePOS and Oracle NetSuite as their end-to-end retail management solution. Seamless integration of their in-store transactions with their cloud ERP system has resulted in effortless unified commerce across all channels and business functions. Previously operating on Everest POS, Bounty Hunter realized that the system was outdated and could not be properly connected to NetSuite, which was already in place as their ERP solution. They needed a modern POS system for their in-store sales that was connected in real-time to their inventory and other important business functions. SuitePOS, built natively for NetSuite, was the best solution for Bounty Hunter and has unified commerce and operations by running everything from their in-store sales, to eCommerce, finance, marketing and more, on a single platform in the cloud. SuitePOS for NetSuite gives Bounty Hunter the option to see their inventory in real-time when making a sale, or to check past purchases, helping customers with exactly what wine options are available to meet specific requests. "Inventory management and visibility was the number one feature that attracted us to SuitePOS and NetSuite," says Don Wetherell, VP of Restaurant Operations at Bounty Hunter. "It is really important for us to be able to accommodate to the customer's particular taste when it comes to wine and spirits, and we don't want to recommend an item that is not currently in stock." Additionally, SuitePOS delivers fast check out speeds and a user-friendly interface which has improved the shopping experience immensely. Before SuitePOS, Bounty Hunter employees would have to manually type in lengthy SKUs to an exact match, resulting in slow checkouts. By offering modern-day search and simple barcode scanning, Bounty Hunter clerks are able to ring up items quickly and get customers out the door in no time. "If a customer is looking for a specific brand or type of wine, the clerk can provide a full list of options to fulfill the needs of that customer," says Wetherell. "Being able to operate everything on the one system has helped us provide a better retail experience from just knowing what is available, to ringing up items quickly. It has really helped us modernize our store." To find out if SuitePOS is the right solution for your business, contact SuiteRetail today. SuiteRetail makes retailers successful by reworking the in-store POS dynamics and replacing it with simplicity, flexibility, accuracy and speed. SuiteRetail’s flagship product, SuitePOS, is a user-friendly and intuitive Apple-based point of sale solution. With SuitePOS, employees ring up sales quickly using familiar devices, and those transactions flow seamlessly into NetSuite or Salesforce. This deep integration delivers a unique architecture that eclipses traditional and hard to operate point of sale software by moving complexity away from the store, and into the back-office, where the entire solution is managed. SuitePOS increases customer satisfaction, delivers higher revenue and lowers cost. The result is unified commerce and effortless scalability across operations and all channels. For more information about SuitePOS or SuiteRetail, please visit http://www.suiteretail.com.